It’s time again for the (18th) annual Kennett Brewfest, and I’m particularly looking forward to this year’s due in large part to the fact that I had to miss last year’s because of a scheduling conflict. But this year the beer Gods have smiled and Kennett and the Delaware Beer and Wine Festival have mercifully fallen on different weekends this year, which means if nothing else that Kennett Brewfest founder Jeff Norman won’t be sending me messages like “Sorry you are going to miss the Founder’s Kentucky Breakfast Stout tomorrow! !” a day before the festival this year. Trash talking during beer festivals? Man, that’s rough. But Jeff, Mary Hutchins and their amazing team have good reason to be a little cocky, after all over the past 17 years they’ve built one of the best (if not the best) craft beer festivals in the area (if not the surrounding area). 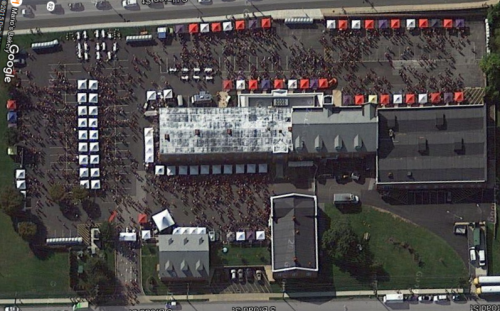 The event out grew it’s original location in a side street of Kennett Square, PA (the same location that now hosts their annual Winterfest, I believe) and in the space of their new location of a parking lot in a healthcare complex has almost taken on a TARDIS like vibe – bigger on the inside. In 2012 when I asked Mary about the size of the festival topping off at 92 breweries, she commented, “we think the number worked well.” But the next year the event grew to 105 and this year it appears that it will top off at around 110. But the best thing about the festival is their constant attempt to rotate in new breweries, assuring that the festival never gets stale. How do you navigate all of this? Well I always tell people that going into Kennett without a plan is like diving head first into a wood chipper – it’s not going to end well, and you’ll only have yourself to blame. So every year, I take my advice and walk into the festival with a firm, deliberate plan to get the maximum amount of beer coverage with the least amount of damage. I’ll have the event mapped out; know where my key breweries are – the one’s I’ll be experiencing for the first time, along with local and not-so-local favorites. I’ll know whose brewery tents I’ll want to stop at for a quick chat to see not only what’s going on there now, but hopefully get a little information about what might be coming up in the future. It will be solid, brilliant plan. Just like every year. And just like every year it will probably all be tossed out the window by the end of the connoisseur’s tasting. That being said, I do always try to have a hard list of a handful of breweries that I really need to check out. Some are based on reputation, some are based on personal desire, and some…well, some are just because. So for better or worse, here’s my annual list of the five breweries I’ll be trying REAL hard to stop at. If you’re going this Saturday, I’d love to hear yours. With each brewery, I’ve included whether-or-not they’ll be participating in the connoisseur’s tasting. I’ve also included any beers that I know they’ll be pouring. Just remember some of the beers might be poured at the regular tasting and some might only be poured at the connoisseur’s tasting. ALMANAC BREWING – Founded in 2010 by founded in 2010 by Jesse Friedman and Damian Fagan, this North California brewery has worked hard to justify its “Farm to Barrel” motto. The two partner with local family owned farms for the freshest fruit available for their seasonal beers, some of which ends up in oak barrels for further fermentation and aging. The craft beer buzz is strong with this one, seek it out I must. What they’re bringing: Pumpkin Sour – spiced brown ale, aged in wine and Woodford Reserve Bourbon barrels with hand-roasted California heirloom pumpkins (C). HERETIC BREWING – I’m going to admit, I need to visit Heretic simply for my own curiosity, because even though the brewery is located in Fairfield, California I feel like it grow up in my presence. The brewery is the project of Jamil Zainasheff, co-author of Brewing Classic Styles (Brewer’s Publications, 2007) and Yeast: The Practical Guide to Beer Fermentation (Brewers Publications, 2010), but it’s through his work as host of the “The Jamil Show” and “The Brew Strong” shows on the Brewing Network that I first encountered him. During those shows he would often talk about the brewery, how things were going, what beers they’d like to make, that I said if I ever got the chance I’d definitely trying their beers. I missed my chance last year, but I’ll be correcting that miscue this Saturday. ZERODAY BREWING – I’ve been hearing and reading a lot about Zeroday including a couple of articles about co-owner/co-brewer Brandalynn Armstrong becoming a strong female player in the Pennsylvania brewing scene. Brandalynn and her husband Theo have built up quite a buzz out of their Harrisburg, PA brewery and I’m looking forward to trying some Zeroday beers. What they’re bringing: A keg of their Phresh Hop APA made with fresh cascade picked 14 hours before the boil (R), and a firkin of their Blue Agave Saison – on Anejo Tequila soaked American Oak Chips (C). BREW BUS BREWING – This brewing company actually started out under a different business model. The initial focus of Brew Bus was to host “leave the driving to us” brewery tours in the southern Florida area (much in the same way as our own Delaware Brew Bus). But when they received a license allowing them to serve beer on the bus, they couldn’t decide which brewery‘s beer to spot light, so they did the next logical thing – brew it themselves. They have a good looking selection of beer, including an Irish red, a porter (2014 Bronze Medal, US Open Beer Championship), and of course, the requisite IPA. Sounds interesting. LEVANTE BREWING – As one of the newest breweries in the Chester County area, I don’t really think I have to explain this one. They’re the new kids that I haven’t had a chance to try yet, so I’ll definitely be making a stop at their tent. Ow, don’t get me wrong, I’ll be stopping at other locals like KSB and 2SP but I’ve heard some solid things about this brewery from some local area beer peeps, so I’ve got to check them out. I tried a plan the first year I went… Now I just wander around like a lost child finding kittens everywhere. And bumping into you every so often to make sure i don’t end up totally lost. 😀 See you tomorrow!!! Can’t wait!! !